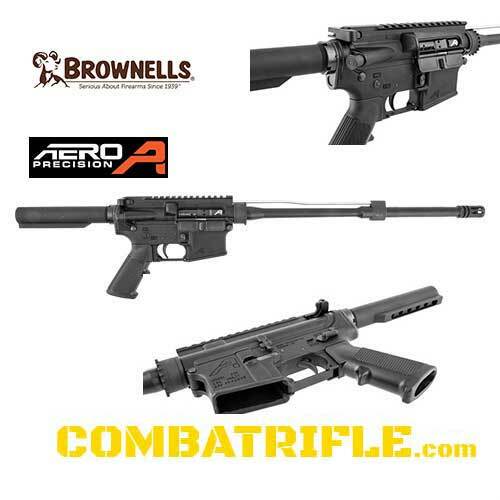 This fully-assembled, nearly-complete, Brownells-exclusive rifle from Aero Precision is constructed using second-to-none components to ensure the highest level of accuracy and reliability, while leaving off the handguard and buttstock – the most customized parts of an AR-15 anyway. Take the money you’ve saved on parts you may throw away, and build the AR-15 of your dreams from the start! Simply choose the free-float handguard that fits your needs, sights, and a mil-spec buttstock, snap them on and head to the range. Due to high demand, we are offering backorders on this product and will be sending out an additional batch for coating. Click here to order directly from Aero Precision. Our August Monthly Builder Set is Multicam Black Hydrodip! 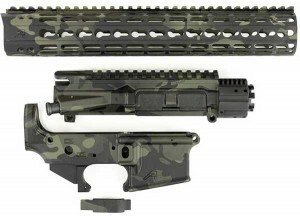 This package deal features the finished pieces you need to assemble your own Multicam Black AR15 M4E1 Rifle, including an M4E1 Upper Receiver, Gen 2 Lower Receiver, 12″ KeyMod Handguard and Billet Trigger Guard all custom Multicam Black Hydrodip. Stand out at the range with a unique and eye catching build. This is a one time offer for this color – once they are gone, they are gone! Hydrodip done by Joint Force Enterprises, an industry leader in custom firearms coatings. The Aero Precision M5E1EK2 FDE 308 features a custom integrated upper receiver and hand guard system. This extremely rigid design allows for a stronger handguard mounting platform to accommodate a multitude of optic requirements. The handguard system is free-floated, giving the owner superior performance and accuracy. All complete rifles are assembled by our professional gunsmiths and are tested prior to leaving our facility. Buy with confidence when you purchase an Aero Precision Complete Rifle.